Last Tuesday night, Margarita Mamun and Yana Kudryavtseva, both from Russia, has struck quickly in the second day of the 34th Rhythmic Gymnastics World Championships 2015 held at Stuttgart Germany. Both gymnasts have won an individual World Title, proclaiming the dominance of Russia in the said sport. Mamun delivered an impressive hoop routine in the Tuesday’s finals, posting a score of 18.950 points to win her sixth World gold and her very first World title with the said apparatus, proving her ability to perform under pressure after making an unexpected mistake in the qualification round last Monday. “I was a bit tired,” Mamun said. “I did three exercises today. But tomorrow is a new day and I will be ready. I made a mistake in qualifications, and it was a bit hard to be prepared for the finals in the evening, but the team helped me.” She continued. Meanwhile, Kudryavtseva, who was considered as the queen of Rhythmic Gymnastics for two consecutive years, maintained to display her dominance in the said discipline. Despite a minor mistake while trying to catch the ball, she was still awarded with the title of “Angel with Iron Wings” the highest note of the evening on either apparatus, 19.025 points. 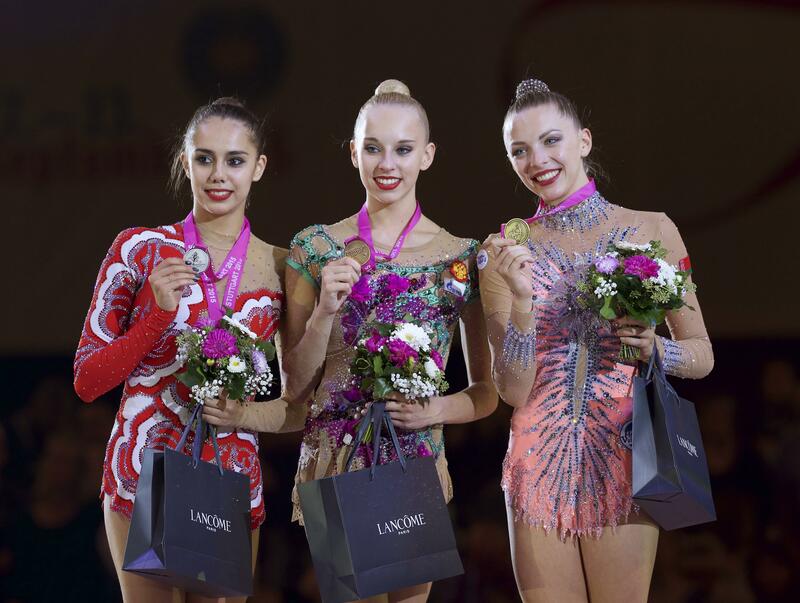 The 17-year-old star, who dominated at the last year’s event in Izmir, Turkey by taking home an impressive amount of medals, was just 0.025 points ahead of her teammate, Margarita Mamun, who posted a score of 19.000 points. The result indicates that Kudryavtseva is now holding the world, European, European Games and FIG World Cup titles in the said discipline. Based on her performance at the Stuttgart, she is likely to add more gold medals to her growing personal record before the competition end on Sunday. Meanwhile, the absence of Kudryavtseva has helped Mamun to recover from the disappointment in the ball event, as it has helped her to seal the gold medal in the hoop competition. Kudryavtseva chose not to compete in the hoop competition this year to prevent aggravating an existing leg injury, but she is expected to compete in the Clubs and the Ribbon discipline. The Rhythmic Gymnastics World Championships continues on Wednesday for the first day of qualifications for the Clubs and Ribbon. The finals for both apparatus will take place on Thursday evening (September 10). Gain more news and information regarding the 34th Rhythmic Gymnastics World Championships 2015 by visiting the Facebook Page of Bianka Panova Academy. Should you be looking for a school that teaches gymnastics for kids, you could check the official website of Bianka Panova Academy to learn more about gymnastics and the different kinds of program that the company offers.